The first line of Pope Francis’ homily at the closing Mass of World Youth Day is the one that has stuck with me the most. He said that we were all in Krakow to encounter Jesus. Now, people come to World Youth Day for all different reasons. Some want to see the Pope. Some want to meet new people from all over the world. 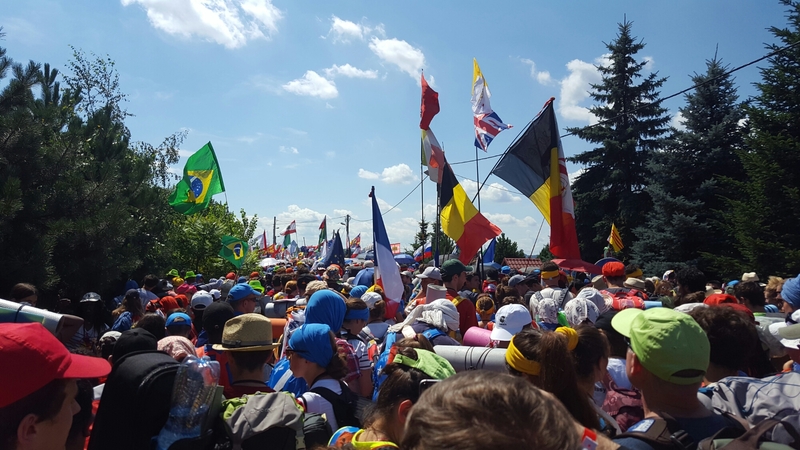 Some are drawn to the location of a particular World Youth Day – like those to came to Poland in order to walk in the footsteps of people like St. John Paul II, St. Faustina Kowalska, and St. Maximilian Kolbe. Some thrive on adventure and challenge – both of which abound when you gather over a million and a half people in one place. Some want to grow in their faith. Some want to know that they’re not alone as young Catholics. Some want to take a journey with their friends. Some don’t even know why they’re there. But all of us – whatever our initial reasons or motivations – in one way or another journeyed to Krakow to encounter Jesus Christ. That is why we were there. And for myself and the pilgrims I have journeyed with, that encounter with Jesus Christ became real and alive. The pilgrim walk to the closing Vigil and Mass at World Youth Day 2016. To be honest, there were parts of the journey that were rough, especially over the weekend. About an 8-mile walk each way to Campus Misericordiae, where the closing Vigil and Mass were held, in strong sun with not enough water. The dehydration that comes from a long walk in the hot sun with not enough water. A chaotic food distribution system, in which some of our pilgrims waited in line for 2 1/2 hours just for the trucks to run out of food bags right before they made it to the front of the line. The inevitable tightness and closeness of a crowd estimated at 1.6 million. A downpour on our walk back to the hotel on Sunday. An almost-lost passport. A cancelled flight. But it was in the midst of these challenges that we encountered Jesus Christ. I’ll always remember sitting with four of my brother priests from the Archdiocese of Indianapolis, plus a Dominican serving in the Archdiocese and a priest from the Diocese of Evansville, for the closing Mass, as Pope Francis drove right by our section on his way to Mass, but with our attention focused ever on Jesus Christ. I’ll remember the extraordinary care and compassion that our Polish tour managers – Gosia and Marek – had for us throughout the week, and how excited our entire pilgrim group was when we found Marek in the middle of the entire crowd leaving the closing Mass. I’ll remember the sight of countless candles being held by pilgrims during Eucharistic Adoration as the sun set on Campus Misericordiae. I’ll remember the bishop who spent the night sleeping on the field with his diocesan pilgrims rather than stay at the bishops’ hotel. I’ll remember our Archdiocesan Mass before we set out on our walking pilgrimage on Saturday, celebrated in the crypt of the Ark Church, built under the leadership of St. John Paul II as a visible testament to the power of faith during the long, hard years of communism. I’ll remember the joy and hope of a young adult couple in our group who got engaged to be married outside that same church earlier in the week, and the joy of our pilgrim community as we see in them the gift they are to each other and the gift they will be to the world. I’ll remember the good spirits and attitude of trust in 33 of our pilgrims – including me – who are spending an extra night in Prague because of a flight cancellation; and the extraordinary perseverance and patience of our Czech Airlines ticket agent who diligently spent three hours getting all of us rebooked on flights for the following day. I’ll remember the deep, strong prayer of young adults who are longing to be a beacon of hope in a broken world. I’ll remember that in Krakow, I encountered Jesus Christ – not necessarily in a different way than at home or in my regular ministry, but in a way that will leave a mark on those who made the sacrifices of a pilgrim journey to the City of Saints in Poland. For that encounter, I am grateful beyond measure. We began the day at the place where St. Stanislas, bishop of Krakow, was martyred in the 11th century by the king for refusing to bow to the authority of unjust rulers. We prayed morning prayer while standing at the bottom of a well where the bishop was killed. Providentially, we were able to join Bishop Kevin Rhodes and the pilgrims from the Diocese of Ft. Wayne-South Bend for Mass at the church built over the site of the martyrdom. In the back of the Franciscan church in Krakow, there is a silver plaque on a pew denoting the place where then-Cardinal Karol Wojtyla prayed each day he lived across the street from this church as Archbishop of Krakow. I think I know why he picked this particular pew – while kneeling there, you have a perfect view of an icon of Our Lady of Perpetual Help at a side altar – the same icon of Mary that is present in the future pope’s home parish church in Wadowice. The pilgrims in our group all were able to kneel at that same spot and pray. And there were some powerful encounters with God in prayer. At the Church of St. Stanislas Kostka in Debniki, we saw the parish where St. John Paul II lived as a young adult while he was attending college across the river at the Jagiellonian University. We also prayed at the tomb of Jan Tyranowski, the young man who was a spiritual mentor to the future pope and helped him discover his priestly vocation. The more I learn about Jan Tyranowski, the more I want to know about him and the more I see him as an inspiration for my own ministry and as an example for young adult Catholics seeking to grow as disciples of Jesus Christ. 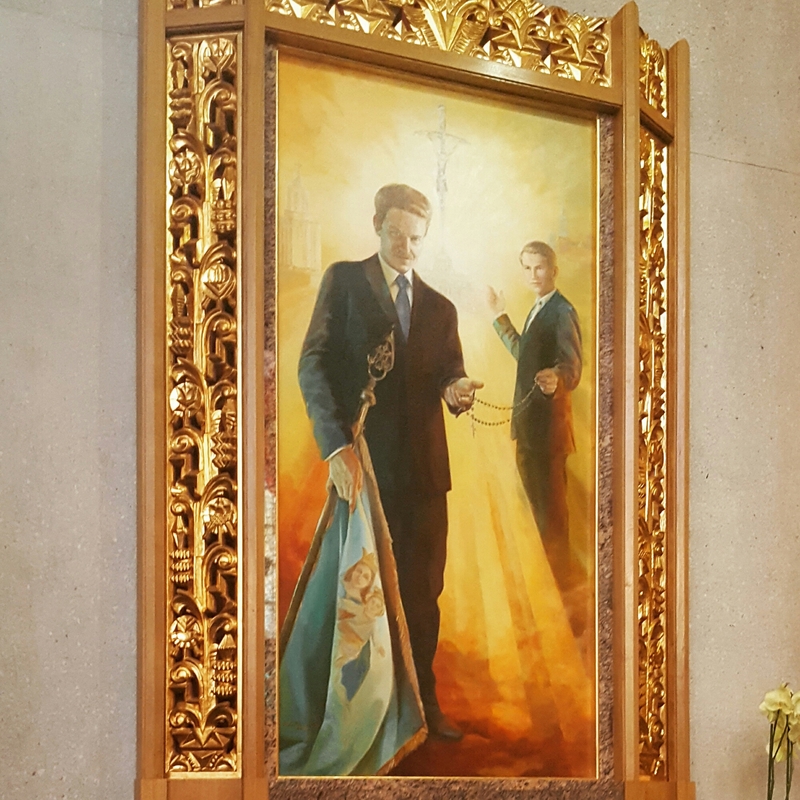 Jan Tyranowski guides a young Karol Wojtyla with the rosary. At the end of the day, several of us visited the Basilica of St. Florian, where a young Fr. Karol Wojtyla served as a college chaplain. There, he began gathering together groups of young people for fellowship and prayer. There, some say, the idea of what would later become World Youth Day began to take shape. And now, a new generation has gathered in this City of Saints to encounter Jesus Christ in the Church, the Sacraments, the Saints, the Holy Father, and one another. This morning, we will celebrate Mass as a large Archdiocese of Indianapolis pilgrimage group before starting our walking pilgrimage to the site of the closing Vigil and Mass for World Youth Day 2016. I don’t anticipate having good internet connection for a while – we will be sleeping outside tonight and spending a lot of time walking or driving in the coming days – but look for a post at some point about the culmination of this pilgrimage. And continue to pray for us along the way.